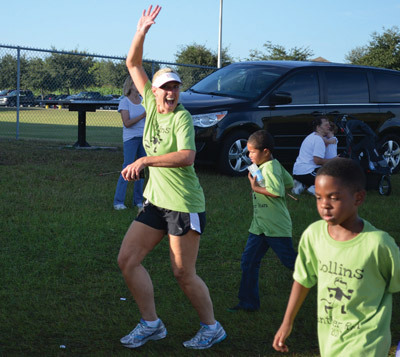 Assistant Principal Teri Madill running with the kids during a previous Panther Run. Lori Themar photos. Students, teachers and supporters at Riverview’s Collins Elementary School will take to the track later this month to raise funds for new computers. The school’s Parent Teacher Association hopes to raise enough money to replace computers that, while they may have been top of the line when the school opened, are now technological relics. The event is set for Friday, Feb. 27, at the school in Panther Trace. Organizers will welcome donations of water and snacks for children after the run. The public can also help by sponsoring youngsters who take part in the run. Madill is a top contender for the open principal’s seat at Collins. The county is expected to make a decision soon on the new principal. Hoping to buy 30 new computers at $879 each, organizers are aiming to raise $20,000 to $25,000 at the event. Buttressed by a fall fundraiser that raised enough to buy 14 new computers, organizers hope the Fun Run will cover the cost of the remaining 16 computers. After the Fun Run, “anything extra we have will all go back to the school,” said Lori Themar, PTA president. 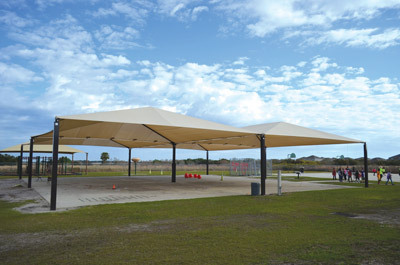 Last year’s run raised $25,000 and helped build a shaded outdoor area for children. This is the third Collins’ Panther Run, a PTA-sponsored event that has become the main fundraiser for the school. While there are some Bay-area companies that will help schools organize fun runs, they also take a whopping 40 percent of the funds raised as a fee, like traditional catalog fundraising companies. “We thought to ourselves, ‘we can do that and give 100 percent of the money raised back to the school,’” Themar said. It’s no small task organizing the event. PTA board members, who are unpaid volunteers, usually spend 25 to 35 hours a week working on the event in the months leading up to the Panther Run. School supporters also have the satisfaction of knowing all the funds raised go to the school. Two weeks before the Panther Run, students solicit donations from friends, family and neighbors for the event, competing for prizes based on the amount of money they raise. On the big day, the PTA provides a Panther Run T-shirt for each student running. The PTA also solicits local businesses to advertise on the shirts to cover the cost of the 1,200 shirts needed for students, teachers and staff. Among this year’s sponsors are Senior Helpers, PDQ, PROtential Sports and Elmira’s Wildlife Sanctuary. “It is a really fun day to get the kids moving and have them be an active part of raising funds for their school,” Themar said. Collins Elementary, which has more military families than any other Hillsborough County elementary school, also does a large Veterans Day celebration: More than 1,000 students sing songs in honor of veterans. Last year, the school started a Wall of Honor. Students brought in a picture of a relative in uniform. The photo salute is currently on display in a glass case in the school’s front office.